Proper gym trackers are slowly on the rise and helping serve your muscle-building needs, whether it's for bodyweight workouts or a session in the weights room. The latest gym-focused wearables can guide you on your form, exertion and reps to help you get the best results faster. Whether you're a die-hard gym bunny that loves spinning or you're just looking for a way to add accurate information from your sessions to your daily activity tracking, there's a wearable to suit you. Where older devices that tracked your movement proved useless on the static machines in the gym, the latest crop of heart-rate sensing tech means that you can get an accurate picture of your calorific burn, whether you're hitting weights or indoor cycling. Below are some of our favourite wearable gym aids, whether it's for HIIT, weights, spinning, treadmdill training, CrossFit and even boxing. We've put most of them to the test, but check back when upcoming devices have been given a full review. 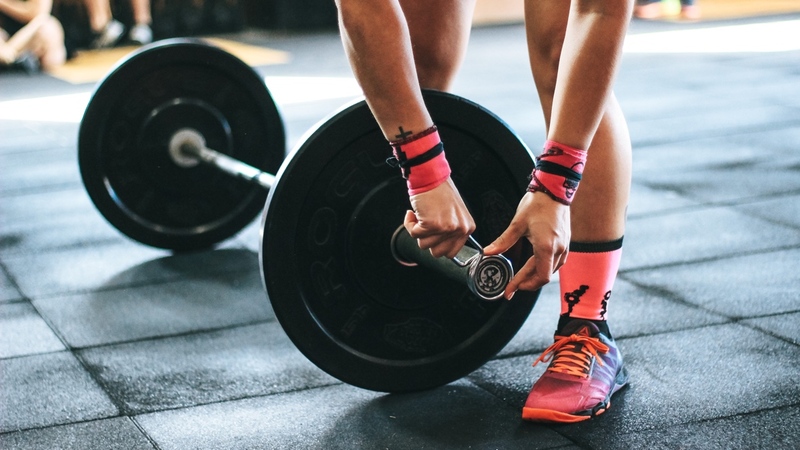 Made by the same team as the Push Band - the wearable aimed at professional athletes and sports teams to assist weightlifting - the Nexus compression sleeve instead looks to add science to CrossFit workouts. Landing in October, the wearable sits inside the sleeve and provides automatic exercise detection, repetition counting, round-by-round splits, cadence, a work-to-rest ratio figure and even a power metric that calculates intensity into a raw figure. When we spoke to Push CEO Rami Alhamad during the Kickstarter campaign for the Nexus, he described how the form factor was much more friendly for CrossFit athletes, since it isn't intrusive of the wrist. And long with tracking the metrics above, the aim of Nexus is to essentially have a coach on your arm that feeds back into the companion app. Once a workout is completed, wearers will be able to see a breakdown of their overall performance, which also builds up over time to provide a look into long-term strengths and weakness and how workouts have varied. We'll be sleeving up in the next few weeks to see whether Nexus is able to deliver upon its aims with accuracy. Moov's latest tracker dares to do something a little different. Rather than going for the wrist like everyone else, it's going for your forehead with a headband. It makes you feel a little silly if you're not used to wearing something on your head, but it does what it says it'll do: accurately track your heart rate for your HIIT workouts. Moov decided to put its tracker up near the temples on your head because of the increased blood flow and thin skin. In our tests, we found that the Moov HR Sweat was able to keep up in the heart rate department with the Polar H10 chest strap. Paired with Moov's great ecosystem and coaching, plus its good battery life, the Moov HR Sweat is a winner. If you can get past how it looks in the gym, that is. Heart rate monitoring chest straps like the Polar H10 are pretty much our go to choice if you want reliable, accurate heart rate data from your high intensity workouts. But not everyone likes to wear chest straps, so what if you could get still get that accurate data from a shirt. We're big fans of the MZ-3 heart rate monitoring chest strap, and with this connected t-shirt you can connect the tech straight into the garment. Another chest strap alternative is the heart rate monitoring armband with Wahoo's Tickr Fit one of the options to move recording BPMs to another part of the body. The Bluetooth and ANT+ Fit can be paired with a host of wearables and, along with real-time heart rate data, dishes out calorie burn information, too. Apple Watch integration means you can gather heart rate data in the Apple Workout app and you can also expect up to 30 hours worth of tracking from its rechargeable battery. There are alternatives out there like the Polar OH1 and the Scosche Rhythm24, but we've spent a lot of time with the Fit for HIIT and we think it does a great job. You're already wearing headphones in the gym to keep you in the zone and block out all of the eye-roll-inducing gym types, right? So it makes sense to build the tracker into a pair of buds. The carbon-encased Jabra Sport Pulse Special Edition earphones place the heart rate tracker right in the inner-ear. There's a resting heart rate test, while the Rockwell test allows users to calculate their VO2 Max by walking 1 mile at a comfortable pace. The Jabra headphones also team up with a companion app to offer voice guided zone and interval training. With the new upgraded Pulse, you also get add automatic and continuous VO2 Max level monitoring, improved sound quality and Comply foam tips to improve fit. Sold on the Pulse? Check out our full Jabra Sport Pulse Special Edition review. And if you prefer the same features without the wires, check our in-depth look on the Jabra Sport Elite. Worn as an armband or on the upper leg, the GymWatch is one of the few wearables designed to measure strength. The user inputs the activity using the smartphone app, while the gadget measures motion. The resulting calculation delivers quantifiable strength data, whether its using free weights, pulleys or lifting the wearer's own body weight. Through the special formulas it is able to calculate explosive strength, speed strength and muscle strength in real time, while it can also determine half/full reps and give users advice on posture. The software is not without its issues, but with strong vocal feedback and a big catalogue of supported exercises, it's a good fit for building muscle. Want to know more? Check out our full GymWatch review. "The first wearable tracker that actually tracks your workout" raised $629k on crowdfunding site Indiegogo. It can detect motion on three axis and measures it against "exercise fingerprints" in order to determine what type of activity you're performing. It knows if you're doing push-ups or bicep curls, and can even learn new exercises by analysing your motion. It'll count your reps, measure your heart rate and also grade the form of each set. With its second generation device, Atlas upped the memory, expanded the exercise library database and now lets you store more exercises to work out with. You can now also take it for a swim. When we first sampled the wearable in our Atlas Wristband review, we enjoyed the smarts but had some reservations about the design. The same was true when revisited through a strength training diary, though what's impressive about the Wristband is that it's still a superior option to most despite its age. Thankfully, a slimmer option in the shape of the well, Shape has now started shipping. The Gear Fit2 Pro is an upgrade on the original Samsung fitness tracker, but not a huge one. You still have built-in GPS, an onboard music player and offline Spotify, an optical heart rate monitor and notifications from your smartphone, but the most notable difference is waterproofing. For those looking at the device as a prospective gym partner, you also get an Automated Dynamic Workout Tracking mode to automatically recognise exercises, as well as rep counting to keep tabs on the likes of crunches, lunges, squats and star jumps. Thanks to these features and that gorgeous curved super AMOLED display, Samsung's Fit2 Pro is a solid all-round performer. However, it's worth bearing in mind that the previous generation is still available and can offer a similar tracking experience for the gym. Garmin recently introduced strength training features to a host of its wearables and it even made it onto the Garmin Vivosport. But the small screen on the feature-packed fitness tracker is not the most ideal for making use of the new mode, so we'd suggest going for one of the watches that include it like the Forerunner 935. It's essentially the Fenix 5 packed into a smaller body and as far as strength training, it will count reps for a series of bodyweight exercises as well as weights machines that will have to of course involve your arms. You can edit rep counts, set timers and breaks in between sets when you need to take a breather. When you throw in the fact that the battery life is stellar on the Forerunner 935, you'll have to put in a fair few sessions before you're reaching for that charger to power it back up again. Now for something a little bit different. Endorsed by Olympic gold medal winners, NFL stars and legends like Michael Johnson, these headphones use neurostimulation to help you train more effectively. Oh, and also play music. Working on the principle that the brain learns from repetition, the Halo Sport's tech stimulates your motor cortex for a period of 20 minutes during athletic training (neuropriming) and increasing the excitability of motor neurons, puts your brain into a state of heightened plasticity known as "hyper plasticity" or 'hyperlearning', for up to an hour. Essentially, wearing the headset during your toughest, highest quality workouts has the potential to accelerate gains in strength, explosiveness, endurance, and muscle memory. Data is tracked in the iOS app with an Android version in the works, this is a gym wearable for serious athletes. Intrigued to find out more? We trained with Halo Sport to see if they really can unleash your inner athlete. The Lumo Run is one of our favourite wearables we've taken out running and was highly commended at the Wareable Tech Awards in our Speciality Sports Wearable of the Year category. Why did we like it so much? Well, it's because the sensor that clips onto the back of your running kits serves up real-time coaching and tracks key metrics like cadence, bounce, braking, drop and rotation. While it's best used outdoors where it can piggyback off your phone's GPS to map out your session, it does still provide useful data and real-time coaching on the treadmill as well. Just make sure you turn off auto pause in the app settings to ensure the app doesn't think you are just stationary. While there are plenty of Bluetooth headphones out there that will let you tap into smart metrics during exercise, crowdfunding success Vi, from LifeBEAM, is one of the first to hone in on AI coaching. After initially only being able to provide you support for the outdoors, LifeBEAM recently added the ability for Vi to be used on the treadmill. Much like the standard outdoor mode, it'll take advantage of the onboard heart rate sensor and track steps and cadence to offer personalised coaching in real time. This is a hearable primarily aimed at beginner and intermediate runners, so don't expect any wild marathon training coaching here, but this is still a very solid choice for anybody wanting to block out the eardrum-popping gym music and get insights from the same device. Hykso is our fave boxing wearable option, which offers a pair of trackers — one to fit under each of your hand wraps — that keep tabs on the number of punches you throw, as well as the type and speed. Interestingly, Hykso also offers the Intensity Score metric through its companion app, which is central to your use of the trackers. This measures the output exertion of the punching motion, with this beginning at 0 at the start of each round before increasing through measuring velocity, type and how well speed is generated behind the punch. Essentially, this provides fighters with a benchmark to track their effort during a workout. Hykso has generally operated through gym chains, but those looking to get their mitts on the rackers can now do so. Hykso recently introduced its new Fightcamp boxing-fitness classes that embraces the punch trackers to monitor performance and ensure you're getting a proper sweat on. Following a recent deal to partner up, sports tracking joint PIQ and US-based Everlast have now launched their first wearable dedicated to boxing — the PIQ Robot. The sensor-packed wearable actually shares its form its tennis tracking sibling, allowing you to get a grasp on punch speed, G-force at impact and retraction time for punches. Since AI tech is also on board for the fight, it means throws are analysed in real-time on the companion app to provide you with feedback on how to punch harder, faster and more efficiently. You can even track those shadow boxing sessions in front of the mirror, as well as bag work and sparring sessions. Like Moov's option, this is designed for fitness boxing, as opposed to heavyweight battles inside the ring. When you're on a bike, a static one at that, attaching them to other parts of your body can be a whole lot more effective. That's where the Wahoo Tickr X, a heart rate monitoring chest strap with added smarts, comes in. As well as offering unwavering heart rate tracking, the Tickr X plays host to its own sensors that when running can measure distance, and in a spinning class can keep tabs on your cadence, a favourite and relatable metric of cyclists. Yes, there are many who don't like wearing chest straps, but we found the Tickr X to be pleasingly comfortable and in no way restrictive during our tests. The strap is easily adjustable, and you don't need to have it uncomfortably tight for the sensors to pick up a solid reading. The Moov Now is a Wareable favourite, giving you the option to track and receive coaching in a number of sports and exercises at a high level of consistency. We love it for running and swimming, but it's also great for indoor cycling. Especially if you have the Moov Sweat HR headband to combine it with as well. Once you've placed the sensor around your ankle like you do for run tracking, it can be used for HIIT cycling where it will tell you to increase cadence or intensity to be able to comfortably get up to the next target interval zone. We've used this one a lot and it really will make sure you push yourself to get the most out of your indoor cycling session. It's also powered by a standard coin cell battery so you won't have to replace it for at least six months. Wrist-based heart rate monitors are not the greatest when it comes to accuracy, but the TomTom Spark 3 is the most reliable we've used and we think it'll make a good spinning partner. It can be paired with a cadence or speed sensor to record indoor biking data alongside your heart rate data. The screen is nice and big, and the UI means you can quickly get a good sense if you're hitting the right zones. There's also a built-in music player on board so you can grab some Bluetooth headphones and leave the phone in your gym locker. Have a look at our in-depth TomTom Spark 3 review to see what we made of the feature-packed sports watch. Be aware that TomTom has now officially exited the wearables industry but you can pour that workout data into a host of third party fitness apps. There is a bunch of yoga apps for the Apple Watch while fitness trackers from the likes of Fitbit offer limited support for yoga tracking. So if you want something built for yoga, these smart leggings could be a good fit. Wearable X's Nadi X Pants and Pulse are a line of yoga clothes that react to your body. They're embedded with technology that senses how you're moving and uses haptic vibrations to correct your movements. So, for example, if your form is off around your hips or knees, the vibrations there will signal to you that you need to tighten up, or move a certain way. Everything syncs to your smartphone app, iOS or Android, and the pants basically work by themselves. The clothes are available in four sizes and four colours – midnight, midnight grey, black and white, and navy grey.